With Martin Luther King Jr Day approaching, consider introducing the idea of diversity and cultural differences to your children. It will be easy to start with this really great egg activity. A great visual demonstration is always tops in our book here at Kids Activities Blog. One of the beautiful things about our little ones is that color, cultural differences and even language usually don’t phase them. Notice that I used the word “phase” because kids are very observant so they do notice the differences. 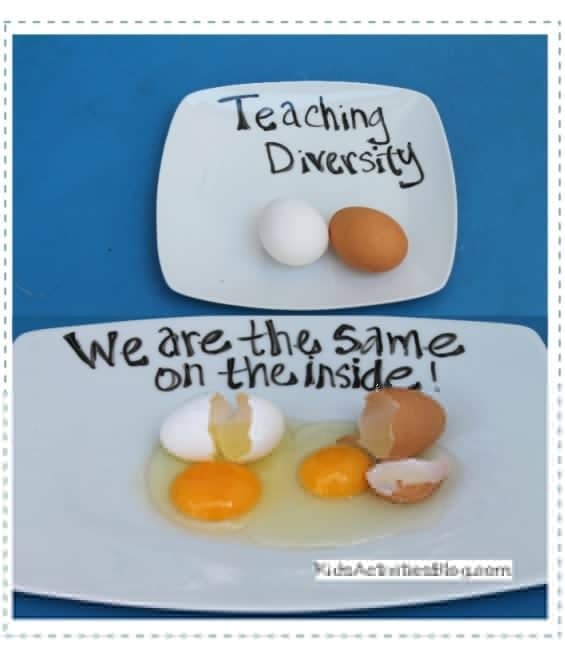 Let’s start teaching them when they are young that accepting and celebrating the differences is a way of life. This will not only have a lasting impression on their own life but impact the world as well. When we first arrived to South America my son didn’t have a grasp of the Spanish language, the children were a bit smaller then his anglo body type (he gets that from his father) and he was a bit lighter than a lot of the kids. His Spanish was basic, he knew a few words here and there like “hola” or “adios” and maybe some numbers but that was it. When he started preschool I was nervous for him knowing that most of the children didn’t speak English and he didn’t speak Spanish. One day I went out to observe him and guess what. He was happily playing with the other boys and girls. They played in their own language but with each other and it wasn’t a problem. It was a beautiful picture of how we should play as adults. When our kids begin to start noticing and sharing the differences pay close attention to how they are expressing themselves. Are they using hurtful words? Negatively? In awe? Discuss with them their observations. This would be a good time to share a very practical lesson on diversity.